Pepperspray Productions reporter Lambert Rochfort fro Seattle,was detained at the US / Canada border and questioned by the FBI, on his way home from Vancouver. 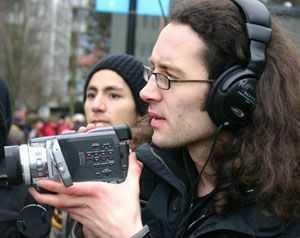 Lambert came to the Olympic host city to report on the anti-olympic protests fro the Vancouver Media Co-op. Glad to see people speaking out, but remember you also have the right not to speak to police, whether or not you're being detained. And playing their games can cause danger to you and others. You had every right to say no comment, just like you have every right to say you feel violated, just like I have every right to not understand why you didn't say no comment, and wonder how you could feel violated by questions that you would surely assume border patrol would ask once they heard why you were in the country. A + B = C.